LETHBRIDGE, Alta. 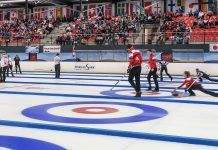 — It was a memorable day for Team Canada on Saturday at the World Senior Curling Championships. 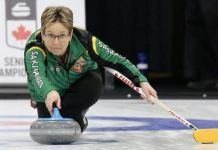 First, Colleen Jones’s Halifax team won Canada’s 11th women’s gold medal in the 16-year history of the World Seniors, cruising to a 10-5 victory over Switzerland’s Cristina Lestander. Then, Ottawa’s Bryan Cochrane pushed reigning world champ Mats Wranå of Sweden to the very limit before bowing 5-4 in an extra end when Wranå made a cold draw to the four-foot looking at two Canadian counters. It was an emotional victory for Jones and her teammates — third Kim Kelly, second Mary Sue Radford, lead/vice-skip Nancy Delahunt and coach Helen Radford. Jones, a six-time winner of the Scotties Tournament of Hearts and a two-time world women’s champ, was wearing the Maple Leaf for the first time since she won gold at the 2004 Ford World Championships in Sweden. Thirteen years later, the sensation of winning a world title at the senior level was just as special, she said. The Canadian team, which carried a perfect 8-0 record into the gold-medal game, took control early and never let go. Lestander had hammer in the first end, but she nose-hit on her blank attempt in the first end, giving the hammer to the Canadians, who immediately made her pay with a count of three in the second end and a stolen three in the third. Switzerland managed to get three back in the fourth, but Jones drew for three more in the fifth, stole another in the sixth, and the gloves came off after Switzerland scored one in the seventh and conceded. So good, in fact, that Jones says she isn’t done chasing national and world championships with her team. Cochrane, vice-skip Ian MacAulay, second Doug Johnston, lead Ken Sullivan, alternate Howard Rajala and coach Bill Tschirhart, meanwhile, had a slow start against the Swedes, falling behind 3-0 after five ends. Sweden scored one with the hammer in the first, and then stole points in the fourth and fifth ends on Cochrane misses. Canada had a shot at a deuce in the fourth; sitting one, Cochrane attempted an angle-raise takeout but was just inside and ended up jamming, leaving a Swedish stone as shot. In the fifth, Cochrane was just heavy on his draw to the four-foot. But Canada rallied to tie the game with deuces in the sixth and eighth ends, sandwiched around a Swedish single. In the extra, Canada had rocks lined up at the back four-foot and top eight, forcing Wranå to the draw. But the Swede made no mistake. Nor should there be. The Canadians entered the gold-medal game unbeaten, and went home with a silver medal, and wore the Maple Leaf with class and pride.